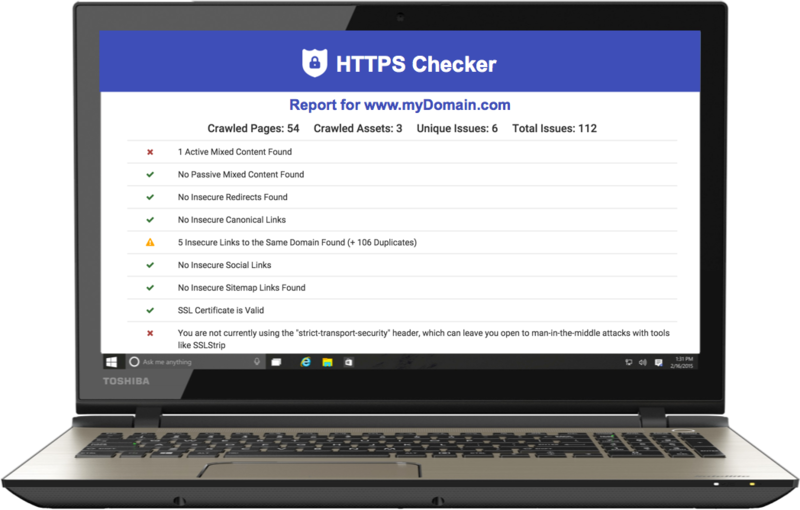 HTTPS Checker | Migrate to HTTPS & Fix Mixed Content. Check your website for common HTTPS migration issues. Find insecure HTTP content loaded over HTTPS, to keep data private, unmodified and trusted by visitors. Desktop HTTPS Checker Online HTTPS Reporter How does it work? Proactively scan your website for HTTPS-related content issues and generate reports via our downloadable desktop app. Capture content issues as they occur on your site in real-time, plus other errors defined in your Content Security Policy. If you're moving to HTTPS, or have already moved to HTTPS then our apps are for you. Our tools aim to help you find answers such as, what HTTPS issues might you have? Why you're on HTTPS but no green padlock shows? Or what are blocked mixed content warnings? Or why you seeing a "Not Secure" warning or Insecure warning in browsers visiting some pages of your site since installing SSL? We aim to help the HTTPS migration process with tools to find out how to switch to https with minimal issues.